The Robert Langen Art Gallery is pleased to announce its latest exhibition, Thicket, by prominent Canadian artist Penelope Stewart, running from Jan. 3 to Feb. 9, 2018. 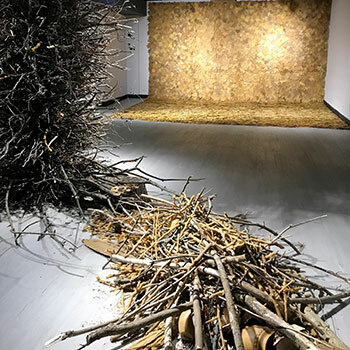 All members of the Laurier family and the broader community are invited to visit the gallery, located in the Laurier Library, to view the exhibition, and to attend the exhibition closing reception on Tuesday, Feb. 6, 2018 from 4 p.m. to 6 p.m.
Thicket is comprised of three imaginary built landscapes, each presenting a narrative that speaks to our sensorial encounters with the emotions of loss, separation, struggle, beauty and desire. Based in Toronto, Penelope Stewart received a BFA from York University and an MFA from the State University of Buffalo, New York. Her multidisciplinary practice includes sculpture, photography and expansive site-specific installations that frequently include environmental themes. In 2017, Stewart was the artist in residence at the Medalta Museum, Medicine Hat, Alberta. She was also named the Nick Novak Fellow for 2017-18 at Open Studio, Toronto. For more information on the exhibition or to book a guided viewing, contact Suzanne Luke at sluke@wlu.ca or 519.884.0710 x3801.